Today you are you! That is truer than true! There is no one alive who is you-er than you! – Dr Seuss. Finally…Surfers Paradise is ready to Ride the Wellness Wave – and we promise that your taste buds will be delighted! When it comes to feeling amazing, looking your best, nourishing your cells and bursting with energy and good vibes, we have you covered. Our store is stocked fresh daily with Cold Pressed Juices, Nut Mylks and Cold Brew Coffee, direct from our juice kitchen in Southport. We also have a fresh daily selection of amazing Raw Vegetarian Salads and Guilt-Free RAW treats. Pop in and say HI and grab your daily fix of liquid sunshine for your cells! Open Monday – Friday 9am – 4pm & Saturday 9am-12:30pm (closed Sundays). Cold-Pressing fresh fruits and vegetables produces an unadulterated, nutrient-rich juice, bursting with enzymes, vitamins and minerals that your cells instantly recognise and love. At our Grab’n’Go store, we stock our complete range of premium Cold Pressed Juice. Look out for Green, Fruits and Roots Cold Pressed Juices, Smoothies and Nut Mylks. 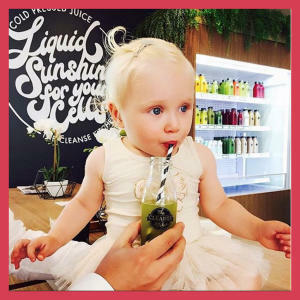 Our juices are bottled in our flagship 500ml, premium glass bottles for extra freshness and quality and because we care about the environment. You don’t find any plastic bottles, straws or cutlery in our store. All of our clean eats are earth to table. This means that all of our food is fresh, plant based, locally sourced and designed to nourish every cell of your body. Expect clean food with a vibrant taste, with no hidden nasties. Our Clean Eats are vegetarian, mostly gluten-free and are prepared fresh each morning by us at our kitchen in Southport. Plant based and nutrient rich whole-food salads made locally with love and creativity. Seriously loud music might play a part in the creation of these gems. Raw Cheesecakes and Slices are our speciality and taste so good, you won’t believe that there’s no nasties inside. Dairy Free, Gluten Free, No Refined sugars, nothing but all plant based goodness. There literally is no catch. Tuck in! Steaming seasonal plant based soups are available during the winter months only. Think light broths and hearty winter soups that are low on fat but packed with nutrients to get you through the day. All of our cleanse packages include: 6 x 500 ml Juices PER DAY, 1 x First Thing Booster PER DAY, Cleansing Tea & Infuser, Psyllium Fibre Blend, Cleanse Guide and Email Support. Order in-store or on-line today! You’ll be so glad you did….